2 Times Extra Wild Classic Slot Review - Casino Answers! 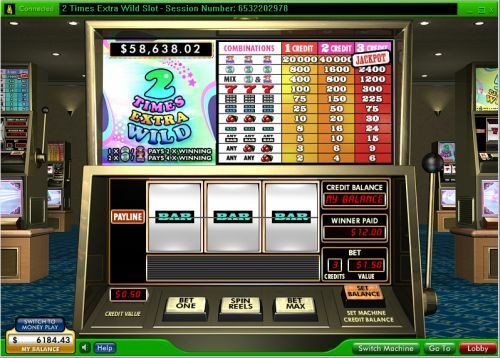 2 Times Extra Wild is a 3-reel, 1-line classic slot machine developed by Random Logic, featuring two wild symbols, multipliers and a progressive jackpot. You can play the 2 Times Extra Wild progressive jackpot slot at Bovada. Each coin on the 2 Times Extra Wild slot machine is worth $0.50. You can play 1-3 coins per spin. Casino Answers recommends using the “Bet Max” button to play the 3-coin maximum bet and be eligible to win the progressive jackpot. 2 Times Extra Wild offers a low cost for casual players looking to win the big progressive jackpot. You can play a 1-coin spin by simply pulling the lever. To play the 2 Times Wild slot game, select your bet and press the “Spin Reels” button or use “Bet Max” button to spin the reels with the maximum bet. The main feature of the 2 Times Extra Wild classic slot machine is its progressive jackpot. At the time of this writing, 2 Times Extra Wild’s progressive jackpot is at a very tempting $58,639. You can win this progressive jackpot by landing three 2 Times Extra Wild symbols on the center payline on a maximum bet spin. The 2 Times Wild and 2 Times Extra Wild symbols are both wild. One of either symbol will double your winnings and two will quadruple them. To play for the 2 Times Extra Wild progressive jackpot, sign up and make a deposit at Bovada! There are 11 winning combinations on the 2 Times Extra Wild classic slot machine. The complete payout schedule is as follows (1/2/3 coin payouts in parenthesis): 1 Cherry symbol (2/4/6), 2 Cherry symbols (3/6/9), any 3 Bar symbols (5/10/15), 3 Single Bar symbols (8/16/24), 3 Cherry symbols (10/20/30), 3 Double Bar symbols (25/50/75), 3 Triple Bar symbols (75/150/225), 3 Seven symbols (100/200/300), 3 2 Times Wild or 2 Times Extra Wild symbols (400/800/1200), 3 2 Times Wild symbols (800/1600/2400) and 3 2 Times Extra Wild symbols (20,000/40,000/jackpot). 2 Times Extra Wild has very good value. For only $1.50 per spin, you can play for a large progressive jackpot. You can play the 2 Times Extra Wild progressive jackpot slot for real money when you sign up and play at Bovada! How can I win the 2X Extra Wild Progressive Jackpot? The 2 Times Extra Wild Progressive Jackpot is won by landing 3 2 Times Extra Wild symbols on the center payline. You need to make the maximum bet to be eligible to win the 2 Times Extra Wild Progressive Jackpot. What are some of the stats of the 2 Times Extra Wild Progressive Jackpot? The 2 Times Extra Wild Progressive Jackpot starts at $30,000. Its smallest win was $60,000, largest was over $100,000 for an average win of about $80,000. Can players from the United States play for the 2 Times Extra Wild Jackpot? No, American players cannot play for the 2 Times Extra Wild Progressive Jackpot. For a great selection of progressive jackpots in the form of both classic slots and video slots, please visit Bodog Casino. Where can I play slots similar to 2 Times Extra Wild? For more of this series of classic slots from Random Logic, please read our 2 Times Wild Classic Slot Review, 5 Times Wild Classic Slot Review and 10 Times Wild Classic Slot Review. You can play all of these classic slot games at Bovada.